There's a corner of our living room that has been in heated (ok . . . maybe not heated) debate over the past few months. I like not having anything in it, but my husband has desperately (ok . . . maybe not desperately) wanted to put a rocking chair there. Now, our apartment is 910 square feet. That's not too bad, but after almost seven years of marriage, we've accumulated enough "stuff" that we're running out of storage room. So, I prefer not to fill every space of our home. 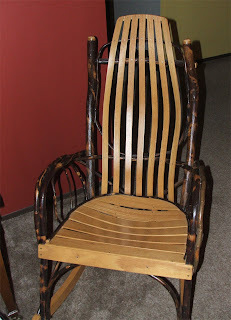 However, my husband has this style of rocking chair he's wanted for a long time. It's the rustic kind . . . you know, made out of branches and tree limbs. It's not that I have anything against these rockers, but the only place we would be able to put it is in the aforesaid debated corner of our living room. So, I've bucked it every time he's looked for one of these rockers. Now, the other thing in my favor is that these chairs run at $200+, right out of the store. Yes! We can't afford one. It's as simple as that! The mere question has been eliminated by our lack of cash-flow. But, not so fast. Craigslist has found us some amazing deals in the past. We've sold a car through it, and bought another one. I found my camera through it (at about a $200 savings, mind you!). But I thought, Even craigslist has its limits! Again . . . not so fast. Saturday, out-of-the-blue, my husband was surfing c-list and lo and behold . . . someone was selling a rustic rocking chair for $50! It was the exact same style he's been hoping for. When he finds it, he furtively looks at me with puppy dog eyes that seem to whine, Pllleeeeaase? I cave. The sacred empty space in our living room is no longer going to be empty. How can I argue against his dream rocking chair at a price we can afford? I can't. *sigh* So, here it is in the formerly empty corner of our living room. I have to admit that I like it.